Can Republicans Be Trusted to Oversee the FBI Investigation of Trump’s Russia Ties? They once found the idea of a president under FBI investigation intolerable. But now most of the GOP is silent. Just six months ago, Republicans found it unthinkable that a president might enter the White House under the cloud of an FBI investigation. “Can this country afford to have a president under investigation by the FBI?” Senator Marco Rubio, campaigning for Donald Trump, asked about Hillary Clinton in September. “Think of the trauma that would do to this country.” White House Chief of Staff Reince Priebus, then head of the Republican National Committee, took it further: “This alone should be disqualifying for anyone seeking the presidency, a job that is supposed to begin each morning with a top-secret intelligence briefing.” Trump himself insisted Clinton’s FBI troubles should keep her from getting even “a low-level security clearance.” House Speaker Paul Ryan went so far as to ask Director of National Intelligence James Clapper to halt the daily briefings Clinton received as a presidential nominee. 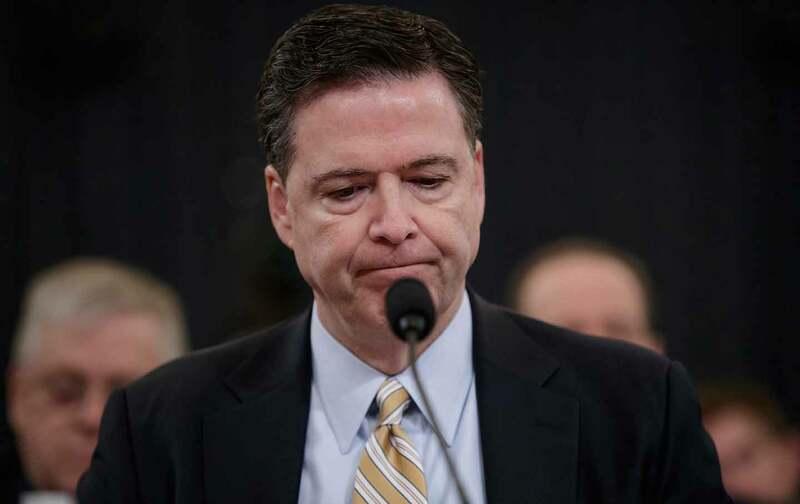 On Monday, FBI Director James Comey confirmed that, since July, his agency has been investigating alleged coordination between the Trump campaign and Russian officials in the hacking and dissemination of Democratic Party campaign materials. The GOP response is predictably hypocritical and pathetic. Trump himself spent Monday morning preemptively rebutting Comey and insisting the “real story” is the “leaking of classified information.” In the House Intelligence Committee, GOP members heard their marching orders, and began pushing Comey to discuss leaks about his investigation rather than the spectacular news that he was confirming an investigation existed. Benghazi-gate über-prober Representative Trey Gowdy was particularly strident, blaming the leaks on former Obama administration intelligence officials. We should note that Gowdy’s infamous Benghazi committee didn’t just leak; it spewed damaging as well as false information about Clinton’s role in the 2012 Libya attack indiscriminately around the capital. “One thing you and I agree on is the felonious dissemination of classified material most definitely is a crime,” Gowdy told Comey with a straight face, but the FBI director refused to even confirm that assertion. Maybe Comey is investigating Gowdy’s handling of classified information—who can say? I’d quarrel with the first part of Nunes’s claim—it isn’t Comey but Trump campaign associates like former manager Paul Manafort, foreign-policy adviser Carter Page, and the awful Roger Stone, along with short-term staffers like Flynn, who put the “cloud” over the Trump administration, by their own associations with Russia and/or their lies about them. I’d agree on the second part, though: The faster Comey can get to the bottom of Trump’s ties to Russia, the better for all Americans. But what congressional leaders can we trust to make sure US intelligence agencies really do that—and will any of them include Republicans? Paul Ryan told reporters, “I don’t think we learned anything new” from Comey on Monday. Really? Not only did the FBI director confirm the Trump-Russia investigation existed, he told the committee there was “no evidence” to prove Trump’s delusional Twitter claim that President Obama had put “tapps” on his phone at Trump Tower. You have to wonder what Ryan would consider “new.” I can tell you one thing: His standards for evidence and scandal will change if Trump can’t muscle through Ryan’s cruel Obamacare-repeal bill and his Dickensian budget and tax cuts. Right now Republicans like Ryan are cynically using Trump to enact an agenda so unpopular they cannot sell it on their own. Trump wooed the white, working-class voters Ryan and Mitt Romney repelled in 2012, with their elite brand of self-dealing country club politics. So Ryan needs him. But if Trump can’t work political magic around Ryan’s awful policy agenda, that could change. We’re told to expect the Senate to do a better job probing the Trump-Russia links. And certainly Senators Lindsey Graham, Richard Burr and John McCain have sounded more exercised about the alleged intervention into the election than most GOP House members. But their concern is not shared throughout the caucus. Texas Senator John Cornyn told MSNBC’s Morning Joe on Tuesday morning that he’s not terribly concerned about Comey’s revelations. He thinks that when former director of national security James Clapper told a Sunday show “he saw no evidence of collusion” between Trump officials and Russia—that ought to have closed the case, even though the current FBI director has said under oath in a congressional committee hearing that the investigation is still ongoing. That’s the kind of selective reasoning you’d expect from Trey Gowdy. Meanwhile, Trump huddled with House Republicans Tuesday morning trying to sell Ryancare to its critics (he’s still not calling it “Trumpcare”). Ryan said Trump “knocked the cover off the ball,” sounding like a proud father, but other House reports were less kind. Trump took no questions, discussed no policy details and warned dissidents they would be “be ripe for a primary” if they didn’t back the bill. Since members of the conservative House Freedom Caucus are pretty well insulated from primary challenges—indeed, they’d be more likely primaried if they supported the bill—it’s not clear Trump’s intervention will pay off. No one should want James Comey, or other intelligence-agency leaders, to wield the power he currently does. His decision to publicly reveal in late October that the FBI was taking a new look at Clinton’s e-mails, after they were discovered on Anthony Weiner’s laptop, arguably threw the election to Trump. Ironically, that decision was said to be at least partly motivated by leaks from the right flank of the FBI to Rudy Giuliani and others about the “new” e-mails (they turned out, predictably, to be duplicates). Republicans were not at all concerned about intelligence-agency leakers back then; they were outraged that a president might enter the White House under FBI scrutiny. Now they’ve opportunistically switched sides. With Democrats a minority in both houses, GOP leaders have effectively forfeited Congress’s ability to investigate and rein in the investigators. We’re at the mercy of leakers with an agenda. That’s no way to deal with allegations of foreign interference into American democracy, but it’s the way we’re stuck with until more Republicans find a conscience. Listen to Joan Walsh discuss Trump and Russia on the Start Making Sense podcast.